While the government drags its feet on solar energy, enthusiastic homeowners are taking matters into their own hands. A COLLECTIVE of Australian businesses and advocacy groups are working to give residents more control over their energy and power bills by establishing virtual power plants in communities across the country. 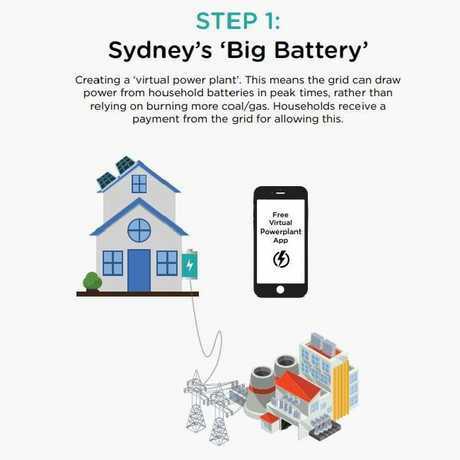 The group's new project seeks to enlist Sydney residents to create a "big battery and virtual power plant" by connecting homes with solar panels and battery storage units in a more effective network. Participating homes would be able to make money by supplying energy to the grid in peak times and would eventually be able to share power between households via a cost-effective app. It's a vision that already exists in Europe but one that faces obstacles in Australia. The group consists of grassroots renewable energy organisations ShineHub, Solar Citizens, Pingala, 350.org and Get Up! They are looking to attract Australians who are frustrated with rising power bills, a stalling national energy policy and what they see as inadequate efforts to address climate change. "They're sick and tired of waiting for policy and big business to solve this. They don't see the current leadership aiming in the right direction," ShineHub CEO Alex Georgiou said about those involved in the project. ShineHub started out by working with community groups to help residents get cheaper access to solar and battery systems. "We work with local community groups that want to see a more renewable and solar self-sufficiency power - more local decision making, ownership and control of their energy needs," he told news.com.au. There are some smaller virtual power plants in action around the country but they typically require users to buy an added piece of hardware and have it installed to gain access to the power sharing platform. That can often cost around $1000, Mr Georgiou said. "What we've been able to do is develop a software-based solution that is basically just like downloading an app, so no hardware (is) required and no additional cost to the customer. They can literally just download the app and be connected into this virtual power plant," he said. The software solution is managed by ShineHub on the Cloud in the background, allowing homes to inject the grid with power and receive payment. Residents are keen to take more control over their power generation and use. Michael Peters, 70, lives in the northern Sydney suburb of Balgowlah and hopes to take part in the Sydney-based virtual power plant project. He got involved with the Solar Citizens group after becoming frustrated by the dithering on climate policy from the Federal Government. "I wanted to do something about it. 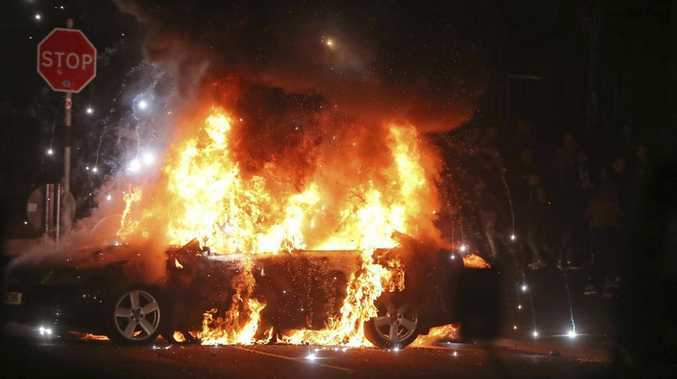 I was really getting quite dispirited about the political response to this and the ideology and so on," he said. "I thought well, bugger it, I'll just go ahead and do it." to me, that meant I was making some contribution to reducing carbon emissions," Mr Peters said. "This virtual power plant essentially says instead of having all this power sitting in a lump of coal, I've got this sitting in a battery and if it's required by the community, then they can use it." For him, it's all about "making more efficient use of what's there" to help the environment and reduce carbon emissions. "Not that I want to make money out of it necessarily, but it would be nice to be able to be rewarded (for building up reserve power and sharing it)," he said. 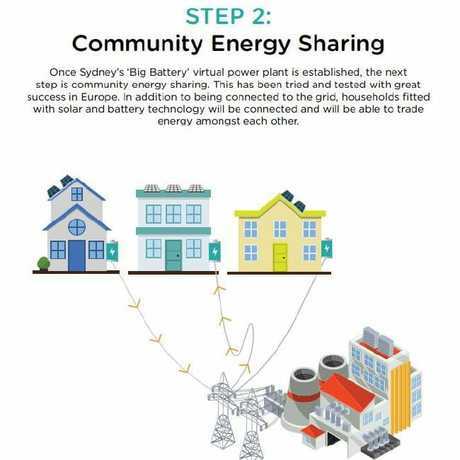 While energy producing households already do push power back into the national energy market through the grid, he wants to see it made easier for households to share and track the power stored and shared by their batteries and eventually move to a more community-controlled renewable energy marketplace. 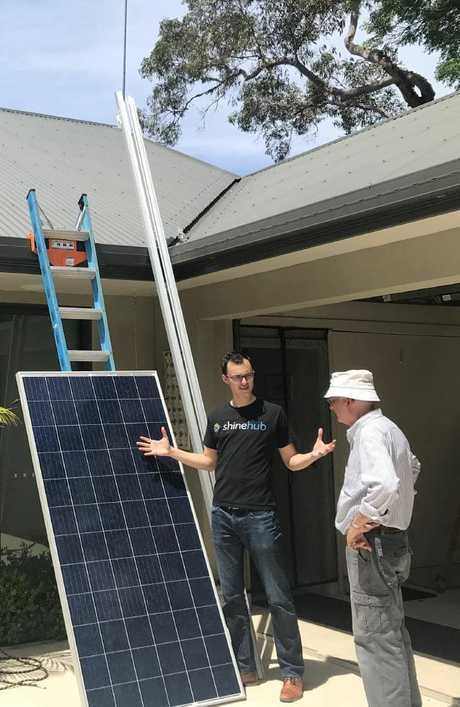 ShineHub’s Alex Georgiou with Michael Peters during the installation of his solar panels. 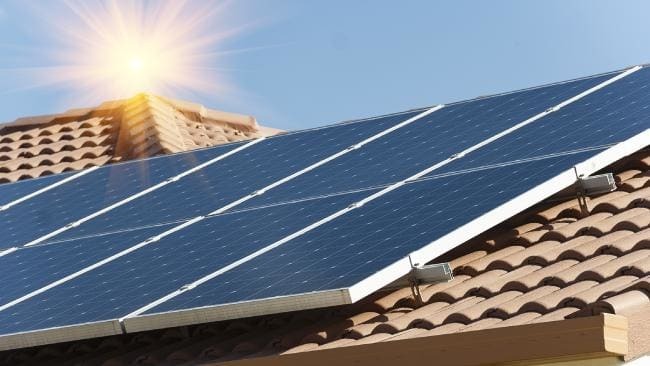 In Geelong, ShineHub recently had about 196 customers sign up for a solar and battery and system and the city will be the site of a pilot program to establish a virtual power plant. The collective behind the initiative is also embarking on an information tour this month to establish a similar community in the Sydney area. Like Mr Peters, many of those involved are also fuelled by a frustration in a lack of environmental policy. "Talking about subsidising coal-fired power stations is in my opinion completely absurd, especially when there are alternative solution like the big battery in South Australia that proves that this actually works," Mr Georgiou said, referencing an idea put forth by members of the Coalition government. In the case of the virtual power plant idea, ShineHub acts like another retailer or middle man. It connects with the wholesale marketer of electricity and the power company and basically draws power from the participating batteries when opportunities arise. "Every time a customer gets their battery used in that way, they get additional money," Mr Georgiou said. The more people on the virtual power plant, the more value they can get, he said. The ultimate goal is to move towards more localised peer-to-peer energy sharing that doesn't incur the cost of the national grid. "Peer-to-peer is not quite ready yet, but that's what we're aiming for down the track. Once the regulation permits that sort of structure." Independent energy sharing is the ultimate goal. The cost of the main grid gets passed on to everyone, even if these communities are relatively self-sufficient, Mr Georgiou said. "That needs to change because without that change you can't sell your solar power for anything more than you would today on a peer-to-peer network." But all of this remains a long way off. "The vision that we want to see happen has already been established in Europe which is more community-led and community-owned electricity decision making." But to get there, he believes it will take five or more years. ShineHub and participating organisations are hosting free events around greater Sydney from September 17 to October 31 to engage with the public and hold workshops on solar-powered virtual plants.